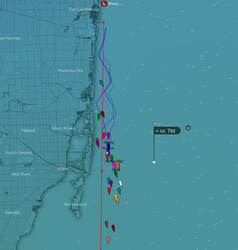 (Fort Lauderdale, FL)- The infamous Fort Lauderdale to Key West Race started today at 1000 hours in a light east/northeasterly breeze of 4-7 kts. The fleet took off on port tack, with most of the big boats sporting either Code Zero’s or A1 spinnakers. The beginning of this a 160.0nm dash down the eastern Florida coastline, bound by the Florida Keys reefs to starboard and the swift-moving 4-6 kt Gulf Stream off to port, does not look like it will set any records of any kind. However, with the ECMWF Euro forecast showing a steadily increasing breeze clocking into the east/southeast overnight and strengthening to 10-15 kts by Friday evening, it should be a beautiful race! At this time on Thursday afternoon, leading the J/Fleet is Chris Lewis’ J/44 KENAI from Lakewood YC in Seabrook, TX. They are followed boat-for-boat by Andy Wescoat’s J/109 HARM’S WAY from Galveston Bay Cruising Association in Spring, TX; then Matt Self’s J/105 RUCKUS from Charleston YC in Daniel Island, SC; then Brad Stowers’ J/92 HILLBILLY from Melbourne YC in Melbourne, FL. If the reaching conditions persist for the next 24 hours (perfect for the asymmetric configured J/Teams- including the J/44 KENAI), don’t be surprised if they all win class and overall! Follow the fleet on the Kattack Tracker here Follow the SORC Series on Facebook here For more SORC Key West Race sailing information Add to Flipboard Magazine.